Jinny Henson is a native Houstonian, a graduate of Baylor University and Southwestern Seminary where she met her husband, John, Pastor of Church for the Highlands, in Shreveport, LA. 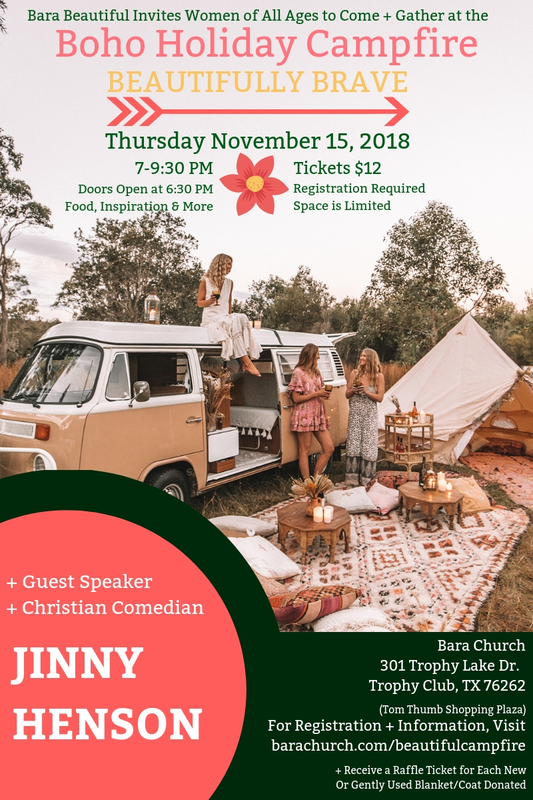 Jinny has taught Communications at Dallas Baptist University and traveled the country entertaining audiences doing stand up comedy for over 20 years for such venues as The University of Montana Billings, Wise Guys Comedy Café in Seattle, ACME Couples’ Marriage Enrichment in Orlando, Florida and Cornerstone Church in Anaheim, CA. Jinny and her husband John are co-authors of a beautiful story of God's redemption in Smyth & Helwys' Maggie Lee for Good available on Amazon.com. The theme verse of her life, John 10:10 states, "The enemy has come to steal, kill and to destroy but I have come to bring you abundant life." Click Here to Register, Girl! Bara Beautiful’s 2nd Holiday Campfire is for all of us .... the momma with the mess in the sink; the mimsy with more souls to care for than she ever imagined; the wife of one (hopefully ; ); the mother of none; the seeker and the believer; the single lady looking for love--or not; the beauty queen and the systematic, shopping machine; the earthy and the other-wordly; the scholar and the doggy-hauler. Does this make sense? Are you hearing us? This one is for you, girlfriend! Though the Holidays can be magical and filling for many, for others, the season can be all-around rough, tapping out emotions, energy and all sorts of resources. Even still, we think this honest insight gives us all the more reason to gather up the girls! The Holiday crunch will not set us back, no ma’am! We are forging ahead with priorities in check and hearts aligned. Let’s eat and laugh and cry and just be together for a while. We will be standing beautifully brave in the situation of the season! Oh come, please come, to the Campfire, all you beauties! Help us spread the word and invite your family, friends, roomies, neighbors, workout-buddies, coworkers and anyone along your daily path that needs this blessing by sharing the invitation and info below on your social media outlets! To save and share: Right click and save the image and then you can upload to Facebook, Twitter, Instagram, etc. to help promote this super fun occasion!